ONYX is a petite little girl who loves cuddles but also has an independent streak. 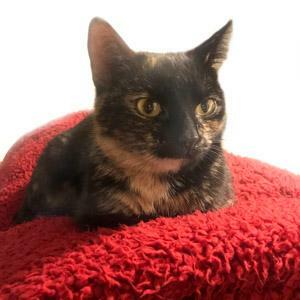 She can also be a tad bit sassy – that infamous tortoiseshell personality! 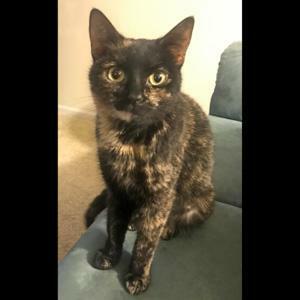 A typical torti, Onyx lets you know when she wants food or you've annoyed her with little a meow, but most of the time she's content to sit near you or get some love. Despite her occasional sass, Onxy is a pretty calm and quiet girl. She doesn't get very rambunctious but will play occassionally with toys. When you go to bed, Onyx joins you for a few minutes of cuddles and then wanders over to a corner of the bed to sleep until you decide to start your day. Onyx needs to be the only kitty in the home, and probably the only pet (no dogs). She definitely has a dominant streak as we observed her hissing and swatting at the other kitties in the cattery we got her from – if they got to close to her. Onyx would do fine with older kids who respect her boundaries, but no young kids or babies down the road. Onyx is a perfect little kitty for someone who wants an only pet who is social, has plenty of personality and is easy to care for. If you want a cuddle buddy with a little personality who won't wake you up at night, Onyx may be perfect for you!